Pioneers in the industry, we offer brass traditional indian bhojan thali and brass bhojan thal from India. 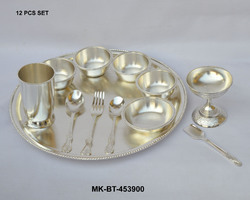 Brass Silver Plated Bhojan Thaal With 5 Bowls, 1 Glass, 2 Spoons, 1 Fork, 1 Ice Cream Bowl With Ice Cream Spoon. 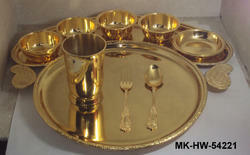 We are suppliers of Brass Bhojan Thal, we M.K.International are manufacturers of brass hotelware items, we are exporters of hotelware items, We supply hotelware products, we are manufacturers of hotelare articles.e are manufacturers of bhojan thal, brass bhojan thal, e are suppliers of brass bhojan thal. We can supply them in high quality silver & gold finish, even could be supplied in 24 Karat gold plated. Looking for Bhojan Thal ?